"I am sorry, but I must defeat you now." 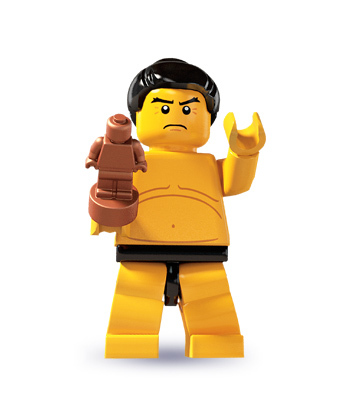 The Sumo Wrestler has dedicated his life to the ancient art of sumo. He has earned the nickname "The Immovable Object" for his ability to stand perfectly still while his opponent tries to push him over or out of the sumo ring. He's recognized wherever he goes, and is always happy to stop and sign autographs for his many fans. He may be big and strong (in fact, he's VERY big and VERY strong), but the Sumo Wrestler is also extremely health-conscious. He watches his calories, makes sure to get plenty of fiber in his meals, and always finishes his vegetables. Like he says, you can't get big and strong without taking good care of yourself! Beli ni tadi kat Queensbay Mall, series 2 & 3 je yg ada, kalau ikut skrg ni dah keluar series 4. Biasa la Malaysia lambat sikit. Setiap series ada 16 character dalam bungkusan rahsia, kalau beli satu tu dapat la apa2 dr dlm series tu, kira random la. Sumo Wrestler ni rasa basic sgt, byk lg yg best2 tp ok laa utk permulaan haha.